I don't ask you for much. Heck, outside of requesting that you constantly visit my site, re-tweet every witty thing that I say, and always stay at least three feet behind me so that we never accidentally make eye contact, I barely acknowledge you. I think it's time for that to change though. It's time for us to take our relationship to the next level. I want our friendship to grow and blossom to the point where I can say "Bob/Susan, I just want to let you know that I really admire your taste in blogs." and you'll know that I truly mean it. I want you to feel like you can ask me for anything, and as long as your request gets through the "Contact Me" filter and the spam blocker on my e-mail, I'll get right on it (within 2-3 business days of course). Basically, I need your help. Actually it's not me, but it's the city I live in. 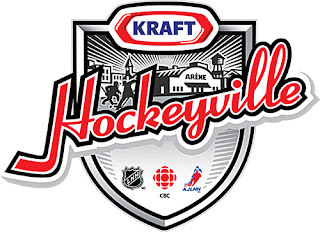 West Kelowna is one of the semi-finalists for Kraft Hockeyville, and we could really use your votes. Kraft Hockeyville is a search for the city in Canada that best demonstrates a love for hockey and a love for their community. To be honest, this is Canada and you probably can't throw a stick without hitting a city that meets that criteria, so to be named one of the top 15 cities by the judges is quite an accomplishment. The winning community gets $100,000 for improvements to their local arena, and they get to host a pre-season NHL game. West Kelowna has made it through the preliminary rounds, but now the voting is turned over to the public, and this is where the going gets tough. See, there's some really crazy people in this country when it comes to hockey. The rules for this competition say that there's no limit on the number of times you can vote, and there's a story about a guy last year who voted over 10,000 times in the three days that voting was open. I can't compete with that kind of crazy....but you can. If everybody who reads this site just voted 9.6 times, we could cancel out Crazy Eddie from the prairies and put this competition back on even footing. You need to be careful though...make sure you only press that last vote down 6/10ths of the way, or you're going to throw all the math out the window! I should add that this isn't one of those votes where you have to submit a whole bunch of information and register to cast a vote. Just follow this link, click on "Vote Now" in the top right corner, then point your mouse at Royal LePage Place, West Kelowna BC and click vote. They'll make you decipher one of those Captcha things to confirm you're not a computer (if you are a computer, let me know and I'll help you with the Captcha), and then click Place Vote. That's it. A screen will come up telling you that your vote has counted, and there's even a convenient button labelled "Vote Again" to help you lock yourself into one of those perpetual circles that I can never seem to get myself out of. Even if you've only got a second to cast one vote, I really would appreciate the effort. I know what you're thinking though..."What's in it for me?" That's a fair enough question. If West Kelowna wins this competition through your efforts, I'll allow you within two steps of me, give you Sunday off from re-tweeting, and I'll even go as far as learning your name...assuming of course that your name is either Bob or Susan. If not, I'll give you time to change it before sending out the thank you cards.